We are light on bookings between now and December 19. Here’s your opportunity to stay in one of New Plymouth’s top central city holiday homes for only $90 per night for two people, but a minimum of 2 nights stay is required. Roomy, comfortable home with gas hot water, gas cooking hob, two lounges with flued gas fires, HRV heating and aircon system. Suitable for anyone but especially holidaying families or people on business. Fully equipped house that has beds for 9. Note: an attached sleepout also has a double bed but it is not suitable for winter use..
Master bedroom has en suite bathroom (shower over bath), main bathroom shower. Two toilets. Unlimited UFB broadband wifi and smart tv with free Netflix. Nice part of town with good neighbours. Parking for 2-3 cars on property. We are negotiable about allowing pets. Please inquire. Perfectly proximate with all the necessities while staying over Christmas! This property was perfectly located for our family of 5 ( which includes three teenagers). Close to Pukekura Park for morning workouts and evening music and afternoon cricket. Close to town for supplies and shopping... and nice historical walking trails close by ( The 2000 year old Puriri tree in Pukekura Park certainly puts it all in perspective). The house has all the holiday necessities- a great shower, plenty of individual spaces for us to spread out, wifi, a kitchen with oven and bench space a plenty to prepare Christmas dinner, a smart TV for Netflix viewing and a large deck to relax on with a wine while watching the resident tui and kereru. We'd definitely aim to stay again during an event like WoMAD or a concert. Note this is NOT a quiet neighbourhood during this Christmas time of year, but that is also its charm, as you feel you're right amongst the buzz of Pukekura Park ( The Lights and Cricket and free concerts practically on your doorstep). Richard is very easy to contact and communicate with and is an excellent host. Kiri’s review captures the essence of this property and it’s location. We know it well as we lived there for several years. They left the house in spotless condition and even took their own garbage away, a first experience for us for which I was inexpressively grateful as garbage disposal is often my personal loathing. Hope to see Kiri & co again. Lovely central place with plenty of room for everyone. Lovely central place with plenty of room for everyone. Warm to arrive to in winter with heaters on which was much appreciated. The house itself was very warm with plenty of heaters. The house itself was very warm with plenty of heaters. I would however like to re iterate that the fourth bedroom is not really appropriate (particularly in Winter months), but there is a second lounge available with a bed in it which can be used instead. Very central and within walking distance. Perfect place to stay for a group attending Womad or festival of lights as it just around the corner. 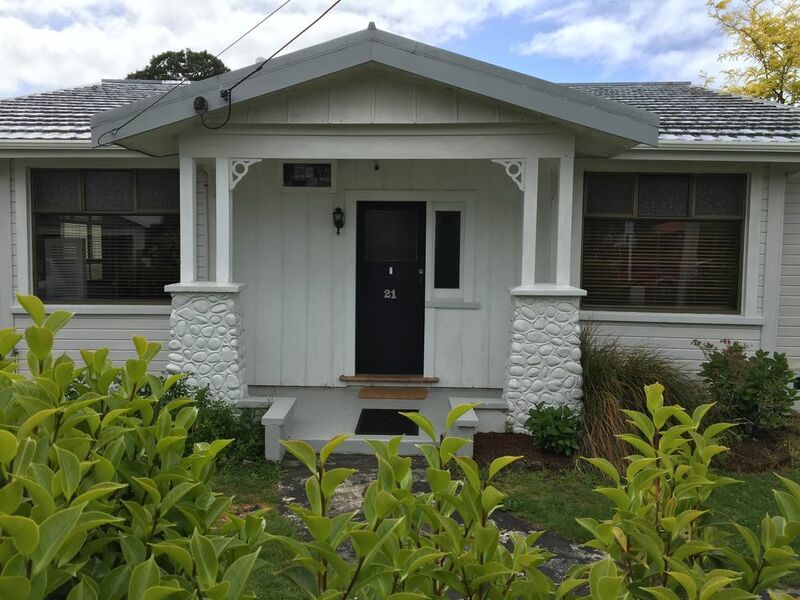 The location of the property is great with a short walk to Pukekura Park. The location of the property is great with a short walk to Pukekura Park. Town is not much further and this also provides easy access to the costal walkway. There is a garage to store bikes and the Original Vila has plenty of space to relax. It even has Fibre internet and a smart TV. It had been used as a long term rental and we were the first users so had a few minor issues which we dealt with and Richard is in the process of fixing. Overall I would stay here again.